Chlamydiae produce a set of proteins, termed Inc proteins, that are localized to the inclusion membrane and exposed to the host cell cytosol. Little information exists regarding the interaction of Inc proteins with the eukaryotic cell. To examine these interactions, Vaccinia virus vectors and mammalian plasmid-based systems were used to express inc genes in mammalian cells. Cells transfected with plasmids expressing Chlamydophila caviae incA were not productively infected by C. caviae. Expression of C. caviae incA also reduced inclusion formation by Chlamydia trachomatis, but not to the degree seen for C. caviae. Chlamydia trachomatis incA did not block development of either C. trachomatis or C. caviae. Deletion mutagenesis was used to demonstrate that plasmids encoding either the amino or carboxy-terminal regions of the protein, as well as the changing of a single amino acid within IncA (serine 17) could not block C. caviae infection. Immunoblot analysis of truncated IncA in a Vaccinia virus system provided evidence that serine 17 of C. caviae IncA is a target for phosphorylation. These experiments provide insight into the interaction of Inc proteins with the host cell and introduce a model system where these interactions can be explored further. The obligately intracellular chlamydiae occupy a nonacidified vacuole (the inclusion) as they grow and divide within infected cells . These bacteria produce a set of inclusion proteins (Inc proteins) that are secreted and localized to the inclusion membrane [2–6]. At least ten Inc proteins have been identified and it is likely that many more Inc proteins are produced by chlamydiae . The analysis of Inc protein structure and function is hindered by the absence of a system for genetically transforming chlamydiae. However, some progress has been made recently using alternate approaches. Microinjection studies demonstrated that Inc proteins contact the host cell cytosol, and that selected Inc proteins are phosphorylated, likely by host cell protein phosphokinases [4, 8]. Two-hybrid analysis demonstrated that C. trachomatis IncA dimerizes, and microinjection of antibody directed at this protein blocks fusion of inclusions . Two-hybrid analysis also showed that IncG interacts with a host cell protein (14-3-3β), and that phosphorylation of IncG is required to facilitate this interaction . These results support a hypothesis that places Inc proteins at a central point in the interaction between the host cell and the intracellular, intravacuolar chlamydial developmental forms. In this study we examined the effects on host cells of plasmid- or virus- encoded IncA or IncA-fragments (Fig. 1), either in the presence or absence of a chlamydial infection. 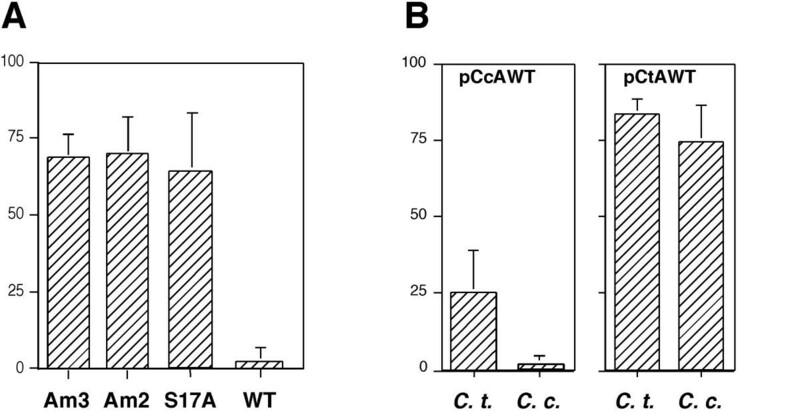 We demonstrate that expression of full length C. caviae incA completely blocks the development of C. caviae and partially blocks development of C. trachomatis. Schematic representations of inc gene constructs used in this study. The plasmid name (left) and a schematic of the predicted protein structure (center), and oligonucleotides used in construction (right; Table 1) are indicated for each plasmid. The scale bar at top indicates the length in amino acids of each predicted gene product. All pcDNA4/HisMax C constructs encode a polyhistidine tag at the amino terminus. Chlamydophila caviae and C. trachomatis incA were also expressed via pcDNA3.1(+), in constructs that do not encode proteins with a polyhistidine tag. A large region of predicted hydrophobicity within each predicted protein is indicated for each construct (darker bar). 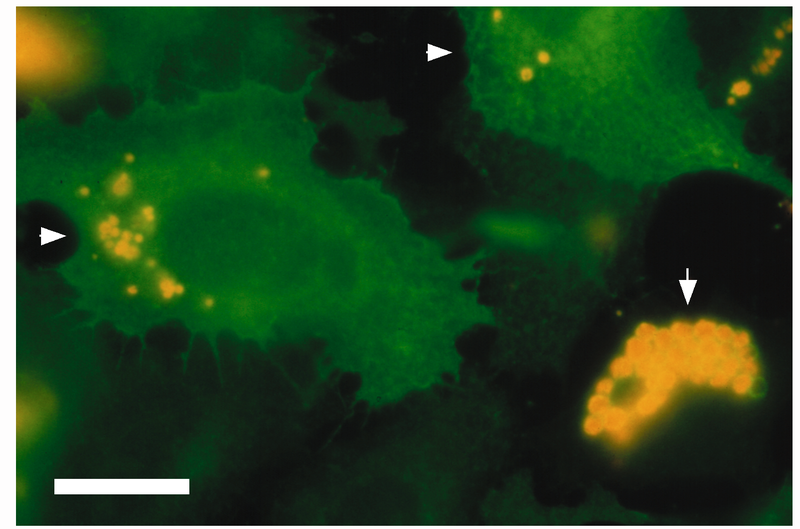 Plasmids encoding C. caviae and C. trachomatis IncA were transfected into HeLa cells and the resulting effects on cellular morphology were examined using fluorescence microscopy. IncA was distributed to discrete regions throughout the cytosol but the cell morphology was not affected (Fig. 2a). However, cells expressing C. caviae incA were refractory to productive infection by C. caviae (Fig. 2b, Fig. 3). These data were expressed quantitatively by examining the percentage of transfected cells that contained chlamydial inclusions (Fig. 4). Plasmid-driven expression of C. caviae incA led to a marked reduction in the number of inclusions formed within cells (P < 0.01 against any other tested plasmid), and the very few inclusions that can be identified in these transfected cells are morphologically aberrant (Fig. 3). This aberrancy is manifested as larger than normal reticulate bodies, with single chlamydial developmental forms occupying individual vacuoles within cells . This is in contrast to inclusions formed in nontransfected cells or cells transfected with any other plasmid produced for this work (Fig. 2, 3). Plasmid-driven expression of C. caviae incA also caused a statistically significant reduction in inclusion formation by C. trachomatis (P < 0.05: Fig. 4), but did not lead to morphological aberrancy of the C. trachomatis inclusions and developmental forms (Fig. 2c). 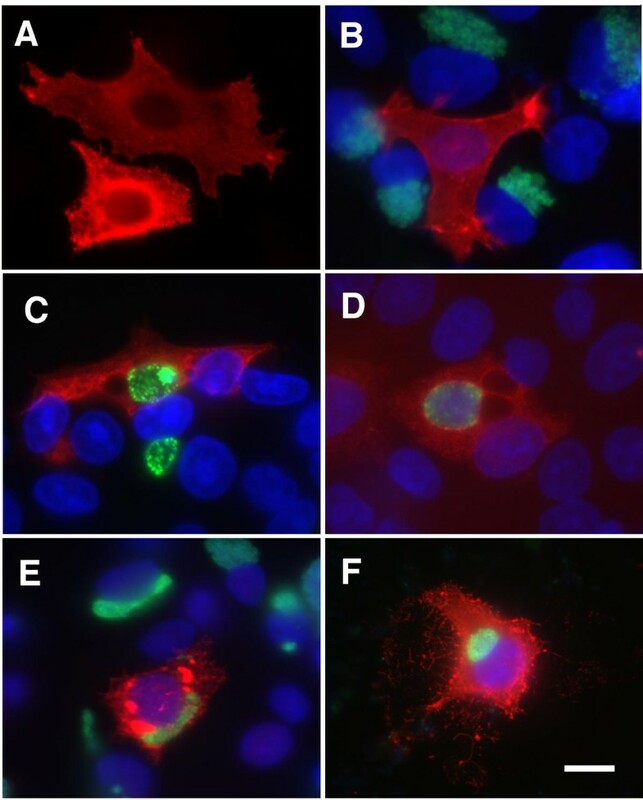 The developmental block is specific to transfection with plasmids expressing C. caviae incA, as transfected cells producing C. trachomatis IncA showed no qualitative (Fig. 2d,2e) or quantitative (Fig. 4) difference in inclusion formation by either species. Effect of cytosolic expression of incA and incC from C. caviae or C. trachomatis. The vector pcDNA4/HisMaxC was used in each construct examined in this figure. IncA was detected by using specific monoclonal antibodies and labeled in red in each panel. Distribution of His/IncC fusion protein in the cytoplasm was detected indirectly by using anti polyhistidine tag monoclonal antibodies (Clontech) and also labeled in red. In panels B-F, the nuclei are labeled with DAPI (blue) and chlamydiae are labeled with anti-HSP60 (green). Panel A; HeLa cell transfected with pCcAWT (C. caviae incA). Panel B; HeLa cell transfected with pCcAWT in a monolayer subsequently infected at an MOI of 1.0 with C. caviae. Panel C; HeLa cell transfected with pCcAWT and subsequently infected at an MOI of 0.25 with C. trachomatis. Panel D; HeLa cell transfected with pCtAWT and subsequently infected at an MOI of 0.25 with C. trachomatis. Panel E; HeLa cell transfected with pCtAWT and subsequently infected at an MOI of 0.25 with C. caviae. Panel F; HeLa cell transfected with pCcCWT (C. caviae incC) and infected with C. caviae at MOI 1.0. The scale bar in F indicates 8 microns for each panel. Examples of aberrant C. caviae inclusions formed in cells transfected with pcDN3.1(+) encoding C. caviae IncA. IncA is labeled green and chlamydial HSP60 is labeled yellow/orange in this image. Aberrant inclusions within transfected HeLa cells are shown with white arrowheads. A typical C. caviae inclusion within a nontransfected cell is shown in the low right corner of the figure (arrow). Cells were infected at a MOI of 0.5 and fixed with methanol 30 h post infection. The scale bar indicates 10 microns. Quantitative analysis of transfection/infection experiments. The data shown represents the number of infected and transfected cells per one hundred transfected cells in the population. In all cases, cells to be used for quantification were infected at an MOI of 1 and were fixed for microscopy at 24 h post-infection. The error bars indicate standard deviations. Panel A; The relative infection efficiency of cells transfected with plasmids carrying each of the truncated or S17A mutated genes of C. caviae shown in Fig. 1 and Fig. 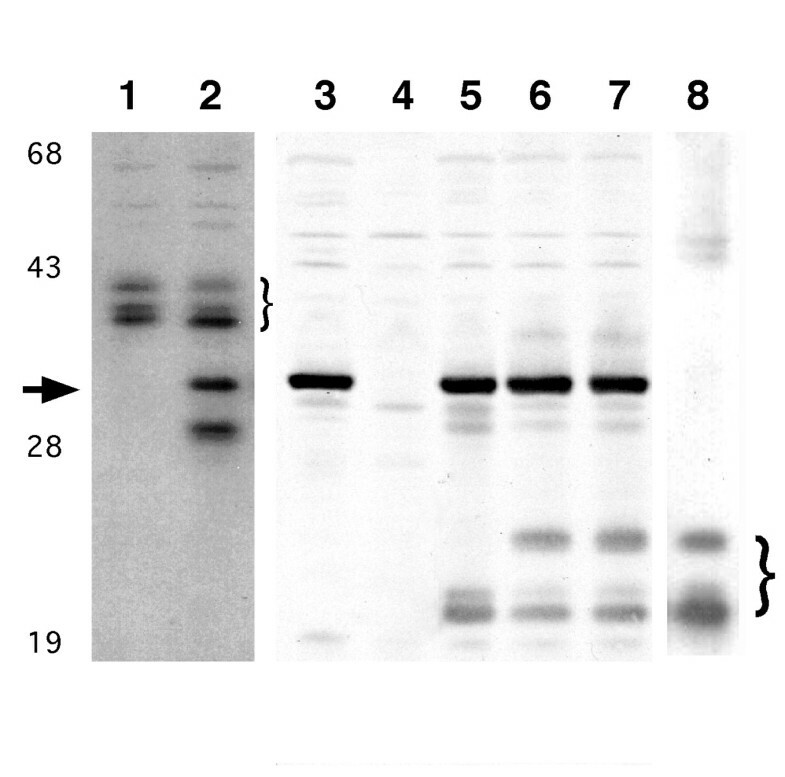 5, as compared to transfection with a plasmid expressing wild type (WT) of C. caviae incA. Panel B; Percent of cells infected with C. trachomatis (shown as C.t.) and C. caviae (shown as C.c.) after transfection with plasmids expressing either C. caviae or C. trachomatis incA (pCcAWT and pCtAWT, respectively). The developmental block observed for C. caviae incA was not host-cell type specific. Each of the transfection/infection experiments was repeated in ChoK1 cells with similar results (not shown). Plasmid pcDNA4/HisMaxC encoding chlamydial IncC were also used in the transfection/infection experiments. Expression of incC from C. caviae (Fig. 2f) or C. trachomatis (not shown) did not block chlamydial development but this expression led to the formation of an extensive network of plasma membrane extensions at the surface of transfected cells. Analyses were then conducted to identify regions of C. caviae IncA that might be important in facilitating the developmental block within these cells. Expression plasmids were constructed that encoded amino- and carboxy-terminal deletions of IncA (Fig. 1). None of the truncated forms of C. caviae IncA blocks development of C. caviae (Fig. 5b,5c. Fig. 4a: P values greater than 0.2). A final construct was examined that encoded full length C. caviae IncA with a single changed amino acid residue, a serine to alanine mutation at position 17 (pCcAS17A). Transfection with pCcAS17A also failed to block development of C. caviae (Fig. 5a) and led to similar numbers of infected/transfected cells, as did controls (Fig. 4a). Therefore changes as small as a single amino acid abrogated the ability of IncA to block subsequent C. caviae development. Effect of cytosolic expression of deleted or mutated C. caviae incA sequences. Cells were transfected with either pCcAS17A, which encodes a protein differing from wild type at only a single amino acid (panel A), pCcAm2, which encodes a protein lacking the amino terminal 60 amino acids of IncA, (panel B), or pCcAM3, which encodes a protein lacking the carboxy terminal 116 amino acids of IncA (panel C). The fluorescence images are labeled with anti-polyhistidine monoclonal antibody (red), and anti-chlamydial HSP60 (green). The nuclei are labeled with DAPI (blue). The scale bar in C indicates 8 microns for each panel. In previous work we showed that phosphorylation of IncA was associated with an electrophoretic mobility shift resulting in two additional protein species at a higher apparent molecular mass in polyacrylamide gels . For our initial analyses of the site of phosphorylation in IncA, a truncated incA sequence was engineered into Vaccinia virus (VV) and the encoded protein was examined by immunoblotting of infected cell lysates. 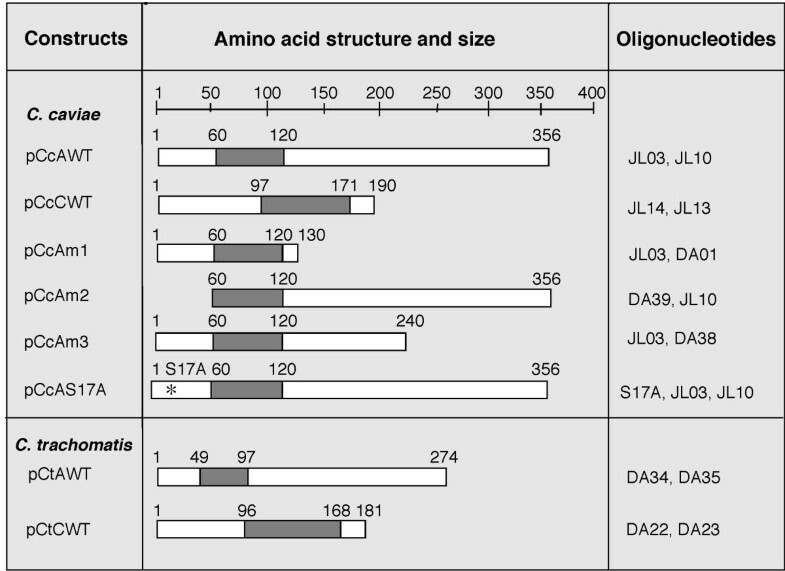 These experiments demonstrated that a polypeptide containing the amino terminal 153 amino acids of C. caviae IncA was modified in HeLa cells similarly to that seen with the full-length protein (Fig. 6). Site-directed mutagenesis of serine or threonine codons in the truncated incA were conducted to examine the effect of individual amino acid changes on the migration of the protein. Altering serine 17 resulted in the elimination of the highest of the three electrophoretic species seen in immunoblots of VV-infected cells (Fig. 6). These results were consistent in three independent constructs that altered either serine 17 alone or serine 16 and 17 in combination (data not shown). Changes at any other serine or threonine in the amino terminal 153 amino acids of C. caviae IncA did not alter on the migration pattern of the protein in this assay. These results suggest that C. caviae IncA is phosphorylated at serine 17 in the VV expression system. Immunoblots of lysates of HeLa cells infected with different Vaccinia virus (VV) recombinants. Full length (lanes 1 and 2) and truncated (lanes 5–8) IncA bands are indicated with brackets. Control VV-infected cells are in lane 3 and uninfected cells are in lane 4. As previously reported [4,8], full length C. caviae IncA migrates as three isoforms when produced during chlamydial infection (lane 1) or when expressed via a VV vector (lane 2). Lane 8 shows that truncated wild type IncA (residues 1 to 153) encoded by VV also is represented as three similar isoforms. Mutation of serines or threonines in the truncated incA are represented in lanes 5 (S17A), lane 6 (S121A) and lane 7 (T145A). Molecular mass standards are indicated in kilodaltons. The arrow indicates a background VV band recognized by the anti-incA antisera in some samples. Although several Inc proteins have been identified in each of three different chlamydial species, their role in chlamydial biology is poorly understood. Inc proteins are present at the cytoplasmic face of the inclusion and likely are critical for direct interactions with proteins in the host cell cytosol [4, 8, 9]. The study of Inc proteins is complicated by their overall lack of sequence identity with proteins in the sequence databases and the absence of a system for directed mutagenesis in the chlamydiae. We used plasmid- or virus-driven expression systems to localize chlamydial Inc proteins into the cytosol of mammalian cells, and to examine the resulting phenotypes either in the presence or absence of a chlamydial infection. Similar approaches have been used to examine proteins secreted by other pathogens into the cytosol of infected cells [11, 12]. The primary focus of this work was to examine the utility of plasmid-driven expression of chlamydial inc genes to deliver Inc proteins to the cytosol of host cells. These experiments were initially designed to determine if IncA could be localized to the inclusion membrane after production in the host cell cytosol. It should be noted that we were unable to deliver an Inc protein to the inclusion membrane using this technique (not shown). However, these experiments allowed the analysis of cellular phenotypes associated with the cytosolic expression of incA or incC. First, we determined that cells transfected with C. caviae incA were refractory to productive infection by C. caviae. These results were demonstrated qualitatively and quantitatively, and the experiments were independently repeated with two plasmid constructs. The observed developmental block was specific to C. caviae incA; C. trachomatis incA had no affect in this system. The differences in effect by these two genes is not surprising, as their predicted protein sequences share only 20% identity [3, 13, 14]. All chlamydial Inc proteins contain a large hydrophobic motif within the coding sequence. As high level expression of foreign hydrophobic proteins can be toxic to cells we included a second Inc protein (IncC) as a control in these experiments. Although production of IncC from C. caviae (Fig. 2b) or C. trachomatis (not shown) altered cell structure significantly, expression of incC in this system had no effect on chlamydial development. Therefore the described block in C. caviae and C. trachomatis development was specifically a function of the production of C. caviae IncA. We observed that, in the few transfected cells that contained inclusions, development of C. caviae was universally aberrant. These results suggest that the reduction in titer is a result of interfering with development, as opposed to interfering with attachment. If the block was associated with attachment, it is likely that some normal C. caviae development would have been observed in the few inclusions within C. caviae inc A-transfected cells. Deletion mutagenesis was used to examine the region of C. caviae IncA responsible for blocking C. caviae development. No truncated fragment of IncA affected the subsequent ability of C. caviae to infect transfected cells. The abrogation of the ability of incA expression to block C. caviae development was observed with changes to IncA sequence at the single amino acid level. A modification of serine 17 was sufficient to remove the developmental block observed with the wild type gene. The mechanism of this block is not known, but we hypothesize that IncA encoded by the transfected plasmid serves as a competitive inhibitor for some host cell molecule critical for C. caviae development. We also hypothesize that the proper phosphorylation state of IncA is required to facilitate this interaction. Through the use of the VV expression system, we provide data suggesting that C. caviae IncA is phosphorylated at that residue, but further experimentation in this area will be required. The importance of the phosphorylation state of an inclusion membrane protein has previously been demonstrated for the interaction of C. trachomatis IncG with host cell 14-3-3β . The results we observed with the C. caviae transgene are analogous to the data in which the effects on chlamydial growth of a dominant negative dynamin transgene were examined . Dynamin participates in both endocytosis and vesicle trafficking within cells , and it is possible that IncA and dynamin affect single process that leads to the lack of productive development by C. caviae . Many intracellular microbes use diverse mechanisms to parasitize the host cell . The intracellular, intravacuolar parasites, including the chlamydiae, interact with the cytosolic compartment at many levels. The localization of Inc proteins at the surface of the inclusion supports a hypothesis that these proteins are important in the cell biology of host cell-chlamydia interactions. We anticipate that the model systems utilized in this work, in concert with other approaches, will be useful for the elucidation of the intracellular biology associated with chlamydial development. 2. C. trachomatis incA had no effect on C. caviae or C. trachomatis infection. 3. Alterations of C. caviae incA sequence as small as a single amino acid abrogated the blocking effect. Chlamydia trachomatis strain 434/Bu (serovar L2) and C. caviae strain GPIC elementary bodies were purified from infected monolayers by passage over a 30% Hypaque density gradient. Purified chlamydiae were stored in 0.25 M sucrose, 10 mM sodium phosphate, 5 mM L-glutamic acid (SPG) at -80°C prior to use . HeLa and ChoK1 cells (ATCC) were cultured in Minimal Essential Medium supplemented with 10% fetal bovine serum (Gibco) and 10 μgml-1 gentamicin and grown at 37°C in 5% CO2. Elementary bodies diluted in SPG were added to the cells at multiplicities of infection (MOI) as indicated. Infected cells were centrifuged at 500 g for 1 h at room temperature (RT), after which the inocula were removed, the cells were washed with Hank's Balanced Salt Solution (Gibco) and medium was added. Cells to be used for microscopic analysis were cultured on sterile glass coverslips at 50 to 80% confluency. After 30–35 h, infected cells were fixed in 100% methanol for 10 min and washed with phosphate-buffered saline (PBS). Cells were then subjected to fluorescent antibody staining or stored at 4°C. Full length C. caviae incA and a truncated incA fragment (nucleotides 1–459) were amplified using Pwo polymerase (Boehringer). Terminal oligonucleotide primers (Table 1; see additional file 1) were designed to yield restriction enzyme sites for cloning into plasmid pRB21, a shuttle vector that allows simple selection of VV recombinants . Alanine substitutions of serine or threonine residues in IncA were produced using a three-primer technique . All amplification products were confirmed by DNA sequencing. Recombinant Vaccinia virus diluted in PBS were inoculated onto HeLa cells and incubated at room temperature for 1 h prior to addition of MEM-10 and incubation at 37°C . Production of IncA and the identification of different IncA isoforms were monitored by immunoblot analysis of VV-infected HeLa cell lysates collected 16 hours post-infection . Plasmids pcDNA3.1(+) and pcDNA4/HisMax C (Invitrogen) were used as vectors in all experiments (Fig. 1). Plasmid pcDNA4/HisMax C vector encodes a polyhistidine tag that was fused to the amino terminus of each recombinant polypeptide. Intact or truncated coding regions of C. caviae incA, or incC, and C. trachomatis incA, were amplified using primers indicated in Table 1. 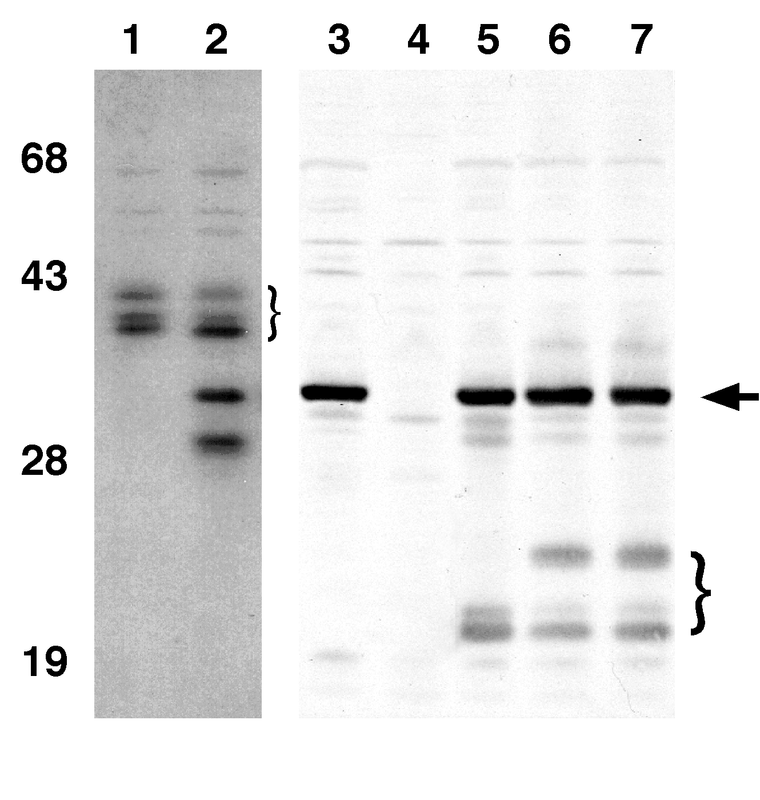 Restriction sites for Eco RI and Eco RV were introduced into the forward and reverse primers, respectively, for each amplification product to be cloned. Reactions were carried out using Pwo polymerase and chlamydial genomic DNA as template. Plasmids from positive clones were purified (Qiagen) and confirmed by sequence analysis. Monoclonal antibody A57B9, directed at a genus common epitope on chlamydial GroEL (HSP60), was used to label chlamydial developmental forms . Polyclonal anti-IncA was produced as described . Monoclonal antibodies to C. trachomatis IncA (mAb 3H7) or to C. caviae IncA (mAb 17F12) have been previously described [4, 22]. Monoclonal antibody to polyhistidine was purchased from Clontech. Fixed monolayers were incubated in 2% bovine serum albumin in PBS (BSA-PBS), as a blocking reagent, for 20 min. Primary antibodies diluted in BSA-PBS were then incubated on cells for 1 h. Cells were washed three times with PBS and then incubated in the dark with the appropriate secondary antibodies for 1 h. Secondary antibodies were purchased from Southern Biotechnology Associates. The cells were washed three times in PBS and coverslips were inverted onto 3 μl of Vectashield (Vectors Laboratories) containing the DNA-specific fluorochrome 4', 6'-diamino-2-phenylindole (DAPI; Sigma; 2 μgml-1). Labeled monolayers were examined at 1000× magnification using a Leica fluorescence microscope and images were collected with a SPOT digital camera system (Diagnostic Instruments). Images were processed in Photoshop 5.0 (Adobe Software) and Canvas 6 (Deneba Software). HeLa or ChoK1 cells grown on sterile glass coverslips were transfected with the indicated plasmid constructs using Lipofectamine 2000 (Gibco) according to manufacturer's instructions. All quantitative infection/transfection analyses were conducted in cells with MOI of 1. Transfected cells were incubated 24 h post transfection and then either fixed with methanol or infected with chlamydiae. Infected cells were incubated 30 h prior to methanol fixation, unless indicated. The efficiency of infection of transfected cells was determined by labeling inclusions with anti-polyhistidine (to detect the product of the transgene) and anti-HSP60 (to detect the chlamydiae). Following labeling, coverslips were removed and the infection rates determined by counting infected and transfected cells, and total numbers of transfected cells, under 1000× magnification. In experiments where HeLa cells were doubly transfected with plasmids expressing incA and incC, a pcDNA3.1(+) construct encoding IncA in the absence of the 6-his tag was used in combination with pcDNA4/HisMax C encoding IncC. Cells were transfected as described and examined by fluorescence microscopy, using anti-IncA and anti-6-His reagents to detect IncA and IncC, respectively. Standard deviations were calculated for each combination of plasmid and chlamydial strain from the average of two or three wells in the same experiment. The number of transfected cells that were infected by chlamydiae in a particular experiment was evaluated in at least three independent experiments for each plasmid construct tested. A total of at least 300 individual transfected cells were counted for each tested plasmid construct. In each case, the significance of the differences between means were evaluated using both the Student's T test and the Kruskall-Wallis test, as calculated using the Instat software program (GraphPad Software). Reported P values represent calculations based on the Student's T test. Damir Alzhanov was primarily responsible for the chlamydial work in this manuscript. Jennifer Barnes and Dennis Hruby designed and performed the work with the Vaccinia virus recombinants. Daniel Rockey was responsible for project design and also conducted some transfection/infection experiments. This work was supported by P.H.S. grants AI42869 and AI48769, and through the Oregon State University Department of Microbiology Tartar Scholarship Fund. We thank Wendy Brown and John Bannantine for editorial assistance. Justin Givens, Doug Grosenbach, Scott Hansen and Jennifer Mayo contributed significant technical assistance to this work.